We are winding down this week as Christmas approaches. There are only four of us working this week, and mostly part days. So we would like to take this opportunity to wish all of you the happiest of holidays. We plan to continue to be jolly in 2010, and invite you to join us. The Monday Motivator: Reach Out! The fall semester’s end coincides with the holidays, so it seems like the perfect time to celebrate. And for many, it is. Suddenly there are no exams to study for or grade. There are holiday parties to attend. And there is time to spend with family and friends again. But for many, these same things do not cause joy, but sadness and loneliness. Just in the past day, I talked with two people who have been slightly depressed. Some of it came from the end-of-the-semester let down when suddenly there is no structure to the days. And some of it had to do with the season’s inability to match up to advertising’s picture of what the holidays should be like. So if you are in the first group, enjoy yourself. Have a happy holiday season. But if you know people who are a little sad, take time out to include them in some of your holiday cheer. And if you’re in the second group, don’t suffer alone. Most people are more than happy to include you if they know you’re alone this season. And reach out to others who are blue or lonely, and you may be the one who makes a difference in their holiday. A colleague of mine recently took me to task for the tone of my last few blogs. She thought that I had been too uniformly positive. I laughed at her, but later I started thinking about the wisdom of her words. Our workplace society is one that praises the positive. We give kudos to the employees who happily go along with the institution’s mission. Let’s face it: we’re happier when we don’t have to fight staff or colleagues over trying to get things done. We praise the positive. We criticize the negative. And I have to agree. I’m certainly happier when the LRC staff enjoys what they’re doing and want to work with me on our projects. But unfortunately, my happiness is not the mission of the LRCl; providing the best service for students is. And labeling what might be constructive criticism or whole-hearted debate as negativity ensures that the best solution for any problem will never be found. It is the wise supervisor or instructor or just plain person who is willing to hear dissenting views and possible problems to get to the best possible solution. Sure, no one wants a never-ending gripe session, but the wise person knows how to distinguish between the two. So this is for my friend who thought I had gotten too positive. Being positive has its advantages. But insisting that everyone around you must agree with you as the only way to be positive is not the answer. Sure, it might make the day smoother in the short run. But it also very well may lead to short-sighted solutions that are not terribly productive and sometimes just downright destructive in the long run. Once I asked a friend of mine why she always included a person who was known to be a little negative on almost every committee she chaired. She grinned mischievously at me, “Oh, Faye,” she said, “she makes me think through my opinions. And she reminds me that I may not be omniscient. That’s not a bad trade for a few negative comments.” I think she’s right. So my motivator for this week is this: Be careful about what you label negative. Our version of the book Christmas tree! 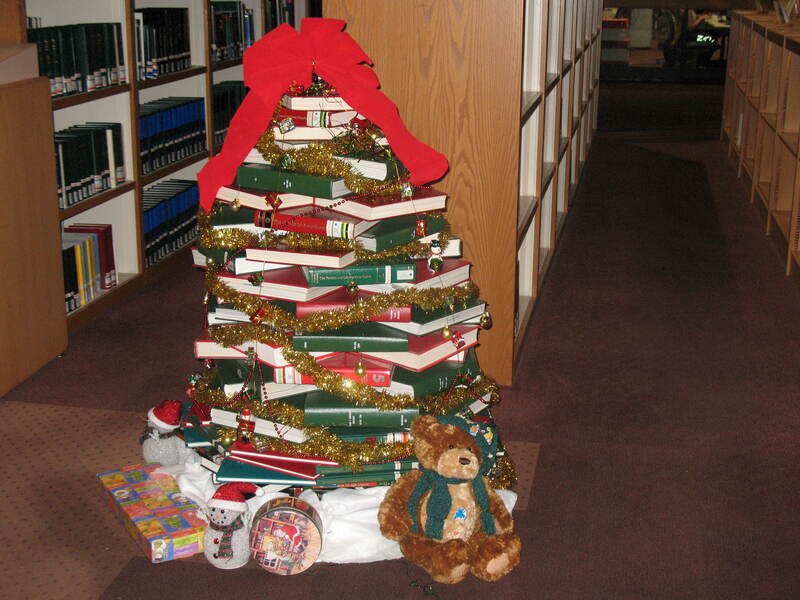 Yesterday Emily emailed the staff a link to a picture of a library Christmas tree made of books. I thought it was cute and wondered if we could do the same. But then I forgot about it. After all, we have students finishing up papers and starting to prepare for finals. And we’re moving things around getting ready for the renovations that are to start in our building in a week. Then later in the evening, we had a small break from the endless stream of questions that always accompany the last week of classes. Maybe we had a moment to get in the holiday spirit. Maybe it was that we had eaten several pounds of the candy we had brought to give out to students. But we started thinking that maybe we could make a book Christmas tree ourselves. So we did. I called Emily out of her cubicle to help me. She went up to find some rarely used books for us to use. I started laying out the first row with some older reference tomes. Then everyone got involved. Charles started looking in one of the closets and found some decorations that had not been used in years. Our student worker Tena helped drape the garland and hang our ornaments. Then Charles found some lights. At the end of the evening, we had a most beautiful book tree as well as two lit up and decorated potted plants. And we, along with the students, had a great time in the process. So what was the lesson learned by the great book tree endeavor? Maybe it’s that the library staff needs to eat less sugar. Maybe it’s that we need to weed out some of those reference books that make up the base of our tree. But it just may be that when you’re the most stressed and sure that you don’t have time to do anything other than work, that’s just when you need to let a little fun in your life. Monday Motivator: Spread Some Cheer! Tomorrow NSCC begins its last week of the fall semester. Students are trying to finish papers and study for finals. The Testing Center, Learning Center, Library, and the Open Lab are full to the brim. It’s a time when many students feel stress and pressure. And this is a time when many faculty and staff members too feel pressure and stress to get everything done. But it also time when the smallest kind and cheerful gesture can make all the difference in the world. So the message for this week: Be cheerful and kind to those who are feeling stressed out, even when it’s obvious they don’t deserve it. One of my most cherished memories from college is from my freshman year. It was the last day of finals, and my roommate had already gone home, taking the alarm clock with her. I overslept and didn’t wake up until my final was to start. Absolutely panicked, I ran to the math building, picked up my test, and sat in the back of the room. Math had never been my best subject, and I was in no shape to do my best work. I was close to tears. Suddenly, my math instructor appeared by my side. In his gentle Iranian accent, he said that I was not to worry. If it took more than two hours, I could stay and finish the test. Now more than 20 years later, I don’t remember any algebra. I remember almost nothing else about that year. But I do remember the kind man who took the time to allay my fear, when he didn’t have to and could have easily berated or just ignored me. I do not always live up to his example, but it is always there as a goal of mine: to put people ahead of policy when possible.